Mounted Planter Toolbars with CCS Bulk Seed tank mounted. Stackbar or Vertical fold toolbar. From 30′ on up to 66′. Most seed tank configurations can be integrated and mounted with catwalks and ladders. All tank mounts are bolt on and removable. 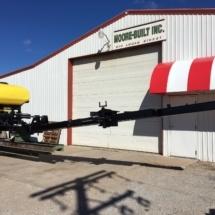 12 Row 36″ Stackbar with Single 50 Bushel CCS tank Mounted. 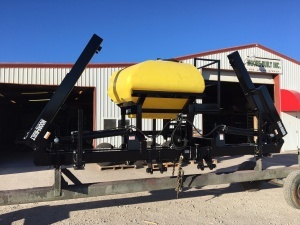 12 Row 30″ Vertical fold planter with CCS tank mounted. 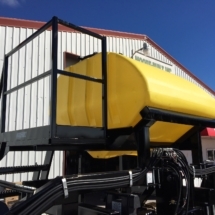 We can mount bulk fill seed tanks for most any type or application. John Deere, Case, White, Kinze, Monosem, etc. Vertical Folding, double wing design keeps weight down, as a result, possibly eliminating the need for lift assist wheels on the larger toolbars. We can mount your choice of tank size, or double tanks. 50 bushel, 70 bushel, 100 bushel, double 50’s, etc. Up to 24 Row 30″ and 36 row 22″ spacing. Customizable to your application. 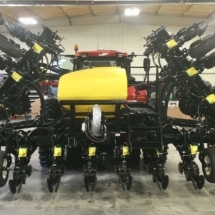 From 15″ spacing up to 40″ row spacing. Front Folding wing tips for a narrower transport width. Wing tips can be raised for turning. 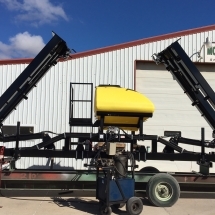 24 row 30" Double Vertical fold Planter toolbar with 50 bushel CCS tank mounted. Outer wings forward fold. 8 row transport width. 50 Bushel tank mounted with cat-walk and folding step ladder. Call or stop in for pricing and availability.